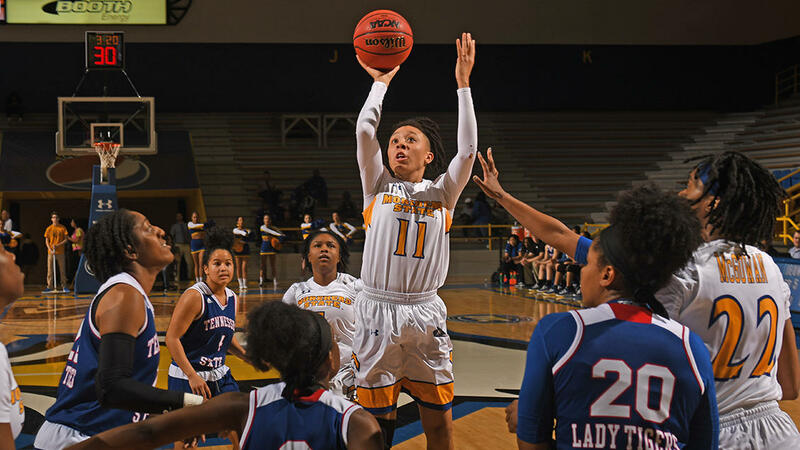 The Morehead State women's basketball team used a 19-6 run over the final 6:51 of action on its way to winning its eighth consecutive game with a 71-55 victory over Ohio Valley Conference opponent Tennessee State on Thursday evening at Johnson Arena. The Eagles (18-6, 9-2 OVC), who led in the game for 39:40, saw the Lady Tigers (3-20, 3-8 OVC) cut their lead to three points (52-49) with 7:12 remaining in the forth quarter. Senior guard Miranda Crockett responded with back-to-back made jumpers to spark the pull-away victory over the final 6:51. "I felt like we did a pretty good job of finishing the game," said Morehead State head coach Greg Todd. "Tennessee State was scrappy and had a few players back from the last time we played them. They've been playing much better as of late so I was glad our bunch came away with the win." The Eagles made 29-of-63 (.460) shots from the field which included makes on nine of their last 12 shots. Tennessee State hit on just 20-of-66 (.303) shots. Senior forward Tierra McGowan led the Eagles with 15 points, six rebounds, and two blocked shots. Graduate forward McKenzie Calvert added 14 points, four rebounds, five assists, two blocks, and two steals. Crockett finished with 14 points and seven rebounds thus extending her streak of double-digit scoring games to 28. The streak began on February 15 of the 2017-18 season at Tennessee State. The win gave Morehead State a season sweep of Tennessee State during the 2018-19 campaign after defeating them 85-62 on January 12 season at the Gentry Center in Nashville. The Eagles have won five-straight games against the Lady Tigers in the overall series which MSU leads 35-27. The win gives Morehead State its third consecutive season with at least 18 wins - a feat that has only been accomplished one other time in program history (1977-1980). Next up, the Eagles will host Belmont on Saturday in a game with serious implications on the OVC. The Bruins enter with a 17-5 overall mark and are one game ahead of Morehead State for the top spot in the OVC with a 10-1 record after most recently defeated Eastern Kentucky on the road 87-52. The game between the Eagles and Bruins is scheduled to tipoff at 2:05 p.m. ET on Saturday. The Morehead State women's basketball team extended its winning streak to seven games with a gritty 67-57 win over Ohio Valley Conference foe Eastern Illinois on Saturday day afternoon at Lantz Arena. The Eagles (17-6, 8-2 OVC), whose seven-game streak marks the program's second longest winning streak against OVC teams in program history, forced 22 turnovers and swiped away 18 steals as they held the Panthers (9-12, 3-7) to their second-lowest scoring output on their home floor of the 2018-19 season. The Morehead State women's basketball team erased a 16-point deficit in the second half on its way to a 73-67 triumph of Ohio Valley Conference foe SIE on Thursday afternoon at the Vadalabene Center. The Eagles, who have now won six-consecutive games, trailed for the first 30:57 against the Cougars. Two makes from the free-throw stripe by senior forward Tierra McGowan with 9:03 remaining in the game gave Morehead State a one-point lead that it managed to string out until the final buzzer sounded. For the second week in-a-row, and the fifth time during the 2018-19 season, Morehead State women's basketball junior guard Aliyah Jeune has been named Ohio Valley Conference Newcomer of the Week.